One of the most common sites in a Thai street food market is a grill, sputtering smoke, covered in smoldering meat kebabs. The vendor will turn the skewers a few times, usually after less than a minute, and sometimes dot on a little marinade with each turn. These always make me think of chicken satay, one of the typical appetizers in Thai restaurants in the US or Europe. Just spotting bamboo skewers in the market, though, doesn’t mean you’ve found Thai satay. 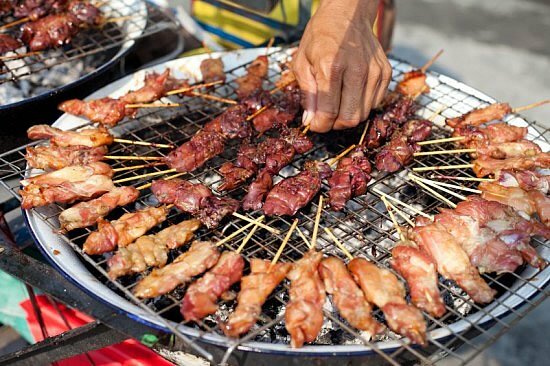 In Thai food markets, street vendors skewer and grill all kinds of meat, from beef strips to pork belly, from an entire speared chicken wing to pieces of offal. Chicken is marinated with spices like coriander seed and turmeric, which permeate the meat with a rich flavor and yellow color. 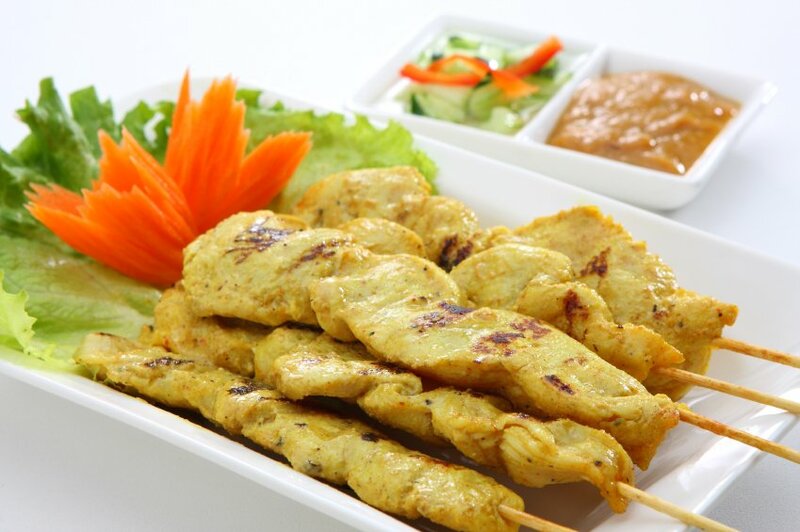 Peanut sauce is what makes chicken satay “satay” instead of simple grilled chicken. In Thai restaurants abroad, peanut sauce also takes the spotlight, drenching not only satay, but sometimes cold noodle salads or sauteed vegetables. Considering the number of “Thai peanut sauce” jars on US supermarket shelves, it’s surprising that peanut sauce is not a native Thai food. It’s actually from Indonesia. In Thailand, peanut sauce is only served on satay or, sometimes, on a different deep-fried snack like a triangle of crispy tofu. In Indonesia, though, different varieties of peanut sauce show up in not just satay, but vegetable dishes like gado-gado or karedok, or coating otak-otak – a steamed fish cake. Peanut sauce is one just part of satay which, like many Thai foods, has developed into a balance of simple, but very different, components – tender grilled meat, rich, grainy peanut sauce, and fresh cucumber salad. Strips of chicken are marinated with spices like coriander seed and turmeric, which permeate the meat with a rich flavor and yellow color. Skewering the chicken in small pieces means that it cooks quickly and evenly, without becoming tough – very important for a small satay stand, where customers order by number of sticks, then wait while their satay is thrown on the grill and cooked fresh. Peanut sauce in Thailand is both very sweet and surprisingly spicy. Made of ground roasted peanuts, it’s richer and fresher-tasting than sauces made from emulsified peanut butter. Garlic, roasted spices, coconut milk, and tamarind pulp add complexity to the peanut base, and fish sauce and shrimp paste bring salt and a deeper flavor. To make this a vegetarian sauce, substitute a little tomato paste to add a similar undefinable, savory flavor to your homemade peanut sauce. The third component of satay is ajat, a simple salad of cucumbers, thinly-sliced shallots, and wheels of chili pepper marinated in vinegar and sugar. Cucumbers in brine look strange tied in a tiny plastic bag, inside the bag of satay, but nibbling on these fresh pickles cools down your tongue in between bites of meat and spicy, oily sauce. Grilled over coals, the sugar caramelizes and the pork pieces char at their edges. Another common site on Thai grills is muu bing – grilled pork. I have a hard time walking past a grilled pork vendor without grabbing at least a single stick to snack on. Thin slices of pork meat are skewered and marinated in spices like coriander root, coconut milk, fish sauce, dark soy sauce, and sugar. Grilled over coals, the sugar caramelizes and the pork pieces char around the edges. Sometimes a single piece of fat is threaded at the bottom, and as it melts it keeps the meat soft and moist. If the meat itself is marbled and fatty, like a slice of bacon, the fat cooks to a char along with the meat. The chunks of fat put me off at first, but after eating a lot of grilled pork, I’ve converted – even if I do sometimes eat around the big pieces of fat, the meat from a fatty skewer tastes richer and more flavorful than a lean skewer. 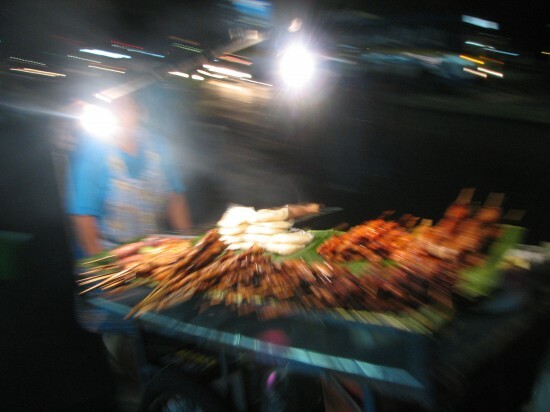 I call another kind of grilled kebab “bar kebabs,” since the most reliable place to find them is from a cart, hitched to a motorcycle, that pulls up outside of busy bars late at night. Pork, chicken, or beef slices are grilled on a skewer with a slice of pineapple, a cherry tomato, and a thick ring of green spur chili. The combination of flavors makes these kebabs easy to keep eating, and the hot chili encourages people to keep drinking, making them a good deal for the vendor, the bar, and the customers. Thai people will order a plateful of these kebabs to share, resting it on the table next to the communal whiskey bottle. If you want to grill some satay at home, Temple of Thai has all of the ingredients and advice you need. Or make it really easy on yourself, and pick up a satay set. Even if it’s not traditional, satay is a great base for improvising with different kinds of meats and fresh relishes. Do you have a favorite way to prepare satay? How about a non-traditional use for leftover sweet-and-savory peanut sauce? Images © Temple of Thai 2010 except ‘Chicken satay with peanut sauce and cucumber relish’ and ‘Thai street vendor barbequing satay sticks’ © iStockphoto.com/Tupporn_Sirichoo and © iStockphoto.com/Lance-Lee respectively.